These Classic Brass Urns are available in three sizes, the small measures 5", medium measures 6'' and large measures 7''. 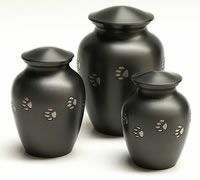 These urns are engraved with paws and have a slate finish. Please choose the correct size for you from the product options below.